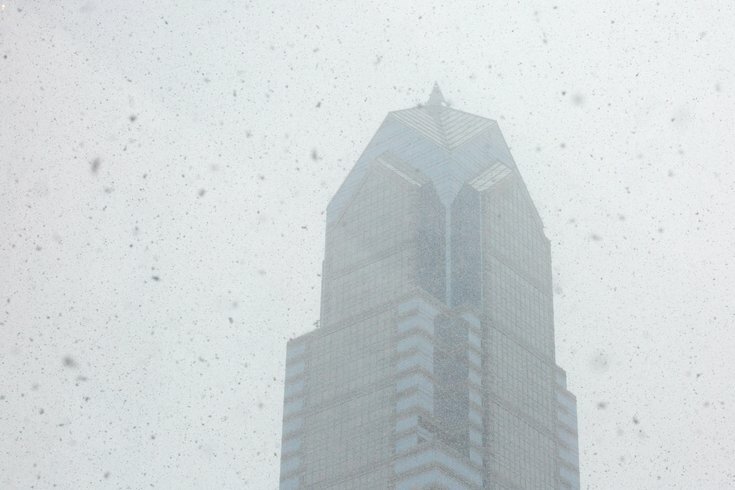 Two Liberty Place is seen through the snow on Tuesday, March 20, 2018. Winter has come early to Philly, with temperatures falling into the low 40s Wednesday – despite the bright sunny skies – and a weather forecast the predicts things will take a turn for the worse as early as Thursday morning. The wintry mix and freezing rain considered a possibility earlier this week is now predicted to come as snow and freezing rain Thursday, starting in the morning and continuing into the early afternoon. Throughout the afternoon Thursday, the forecast shows a continuation of rain and snow before turning to just rain around 4 p.m. Temperatures aren't expected to go higher than 37 degrees. Rain will continue into Thursday night and early Friday. Throughout the day Friday, sun will return with a temperatures reaching 47 degrees and likely melting any ice accumulation, which could range from less than half an inch to three-quarters of an inch. As precipitation is predicted at 100 percent for Thursday, the next few days also look to be a bit blustery. Winds will range from 13 to 15 mph on Thursday and Friday. • Wednesday: Mostly sunny, with a high near 42. Northwest wind 9 to 11 mph. At night, mostly cloudy, with a low around 29. North wind 5 to 7 mph. • Thursday: Snow and freezing rain before 1 p.m., then rain and snow until 4 p.m., Followed by more rain. High temperature near 37 degrees. Northeast wind 8 to 14 mph. Chance of precipitation is 100%. Little or no ice accumulation expected. New snow accumulation of less than a half inch possible. In the evening, more rain. Low temperature about 37 degrees. Northeast wind 13 to 15 mph. Rainfall total between one-half and three-quarters of an inch. • Friday: Rain likely, mainly before 1 p.m. Then partly sunny, high near 47 degrees. West wind 13 to 15 mph, with gusts up to 25 mph. Chance of precipitation is 60 percent. Skies mostly clear at night; low around 35. • Saturday: Sunny, high temperature near 49 degrees. Then mostly clear at night, temperature falling to around 34. • Sunday: Partly sunny, high near 48 degrees. Sunday night mostly cloudy; low around 35. • Monday: Partly sunny, high of 47. Then becoming cloudy and temperature dropping to about 31. • Tuesday: Sunny, high near 42 degrees.